Ok so i havent posted in a while and im not going to make any excuses...Its only my fault! But i do what to apologize to thatgirlsophy! 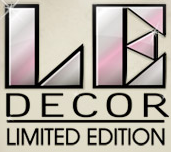 So i just wanted to let you know that LE decor is out! And in my opinion its actually ok! I prefer the clothes though but some of it its nice! Take a look and tell me what you think!